All the Basic Guide for Scaffolding! Let’s first understand what is scaffolding. Construction is a vast field. It involves so many processes, stages, materials, and tools. Scaffolding is a temporary or movable structure made of wooden planks and metal poles, used by workmen while building, repairing, or cleaning the building, bridges and all other man made structures. It is also called ‘staging’ or ‘scaffold’. Scaffolds are widely used on construction site to get access to heights and areas that would be otherwise difficult to get to or to reach. Scaffolding is a temporary platform used to elevate and support workers and materials during the construction, repair, or cleaning of a structure or machine. It consists of one or more planks of convenient length and size, with various materials and various methods of support, depending on the form and use. There are various materials used in scaffolding. It depends on the local availability of materials and its cost. Before the use of metal tubes as scaffolding, in the early 1900’s wooden branches or bamboo were widely used as a method of scaffold construction and are still used. In India wooden materials are easily available at lower cost. Therefore, in India bamboo and wooden poles are used as scaffolding materials. Tubular scaffolding of steel or aluminum has largely replaced wooden scaffolding on most large construction projects. Tubular scaffolding can easily be erected in any height, shape, or length, with better safety. Depending on where you’re working in the world, different types of scaffolding systems will be seen in different country. In some countries of Northern Europe, labor is very expensive. Thus, aluminum scaffolding is becoming more common. Most of scaffolding has to be manually lifted to be put in place, and aluminum is lighter than steel, and lighter scaffolding means that the scaffold can be built, reducing labor cost too. In some countries, aluminum is expensive and labor is affordable, so wooden poles and bamboos are very common. Bamboo is more commonly used in Asia where it’s favored for, flexibility, strength and eco-friendliness. Hong Kong is the well-known city that uses bamboo scaffolding even for skyscrapers. Highly-skilled designers and technicians are required for design and construct through multiple stories with bamboo. Sometimes it is known as modular scaffolding. This type of scaffolding consists primarily of vertical and horizontal pre-engineered components that connect together in a systematic manner. Systems scaffolding is most used type of scaffolding across the globe. There are so many manufacturers, each having specific efficiencies. Some perform well in very highly loaded conditions and others are more suited to smaller scaffold structures. Systems scaffolding includes many different types of scaffolding that can be used to create standardized scaffolding bays. 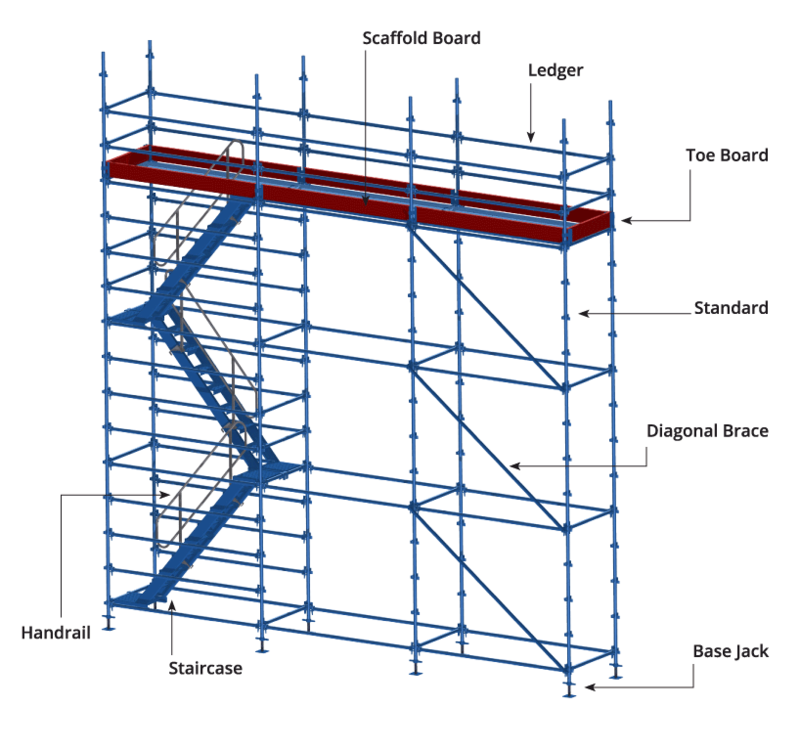 Here we have explained three system scaffolding namely, Cup lock scaffolding, Kwikstage scaffolding and Haki Scaffolding. Single scaffolding is generally used for brick masonry and so it is also known as brick layer’s scaffolding or brick scaffolding. It consists only one vertical support (which is called standard), hence it is called single scaffolding. Single scaffolding involves standards, put logs, ledgers etc., which corresponds to the wall at a distance of around 1.2 m. Distance among st the standards is approximately 2 to 2.5 m. Ledgers join the standards at an upright distance of 1.2 to 1.5 m. Put logs are removed from the gap remaining in the wall to one end of the ledgers. Put logs are positioned at a gap of 1.2 to 1.5 m.
Double Scaffolding is normally used for stone masonry. So, it is also known as mason scaffolding. It is also known as the independent scaffolding. It is impossible to make holes in the stone wall for supporting put logs; thus, two scaffolding rows are made to make it robust that is why it is called double scaffolding. The first row is placed about 20 to 30 cm away from the wall, and another one is 1 m away from the first row. Then after put logs are placed that are supported by both the frames. In order to make it more strong cross braces and takers are provided. In this type of scaffolding, the standards are supported by a chain of needles and these needles are pulled out with holes in the wall. This is also known as “single frame” scaffolding-type. In second type, needles are supported inside the floors via the openings and this is called independent or double frame scaffolding type. When constructing this type of scaffolding, enough care should be taken. Some scaffolders don’t classify this structure as scaffolding, because it isn’t built from the ground, but we can consider it as a scaffolding. Ultimately, its main purpose is to support scaffolders and their supplies. Suspended or swinging scaffolding consists of a platform that is suspended by a cable system that allows the platform to climb up and down to various heights. 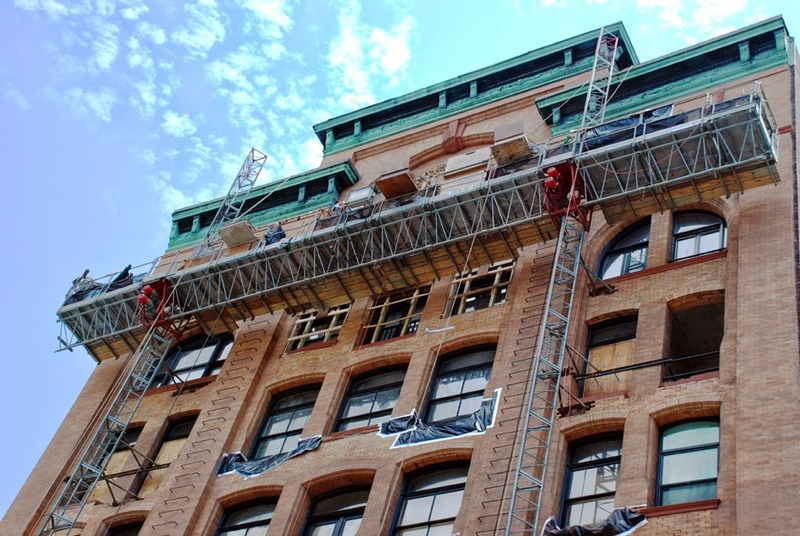 This type of scaffoldings can provide significant savings on very tall structures that need light duty access, like ongoing building maintenance and small improvements. Although wooden scaffolding is used almost everywhere, there are regulations for how to build it. It is more common outside of North America and Europe. Pre-cut lumber was the most common type of scaffolding until steel, and the fabrication of materials, became more affordable. Normally all wooden members, vertical and horizontal are tied with coconut coir rope at all joints. This has low initial cost but short life. They are not suitable where duration for which scaffolding has to be kept is more or there comes monsoon in between as its strength entirely depends on coconut coir rope. This scaffolding is one of the earliest types of steel scaffolding. It consists of two parts, including the tubes and clips, sometimes called ‘couples’. It is very simple and one also popular because of its’ easiness in assembly and disassembly. To erect the scaffold, you have to connect tubes together to make long runs and then connect the verticals and horizontals together with clamps built specifically for these tubes. This system is very flexible as you can place the verticals tube wherever you need them. Where other types of scaffolding don’t easily form or adjust to odd shapes, tube and clamp scaffolding can be adapted to round, straight, or irregular shapes. The steel in this type of scaffolding is specially designed to protect against corrosion and rust, which mean that it is a good choice for regions with harsh weather. There are specific requirements that scaffold companies and designers must fulfill. This has long life but high initial cost. This type of scaffolding is generally made from galvanized steel. This scaffolding is popular for its capacity to support heavy loads. 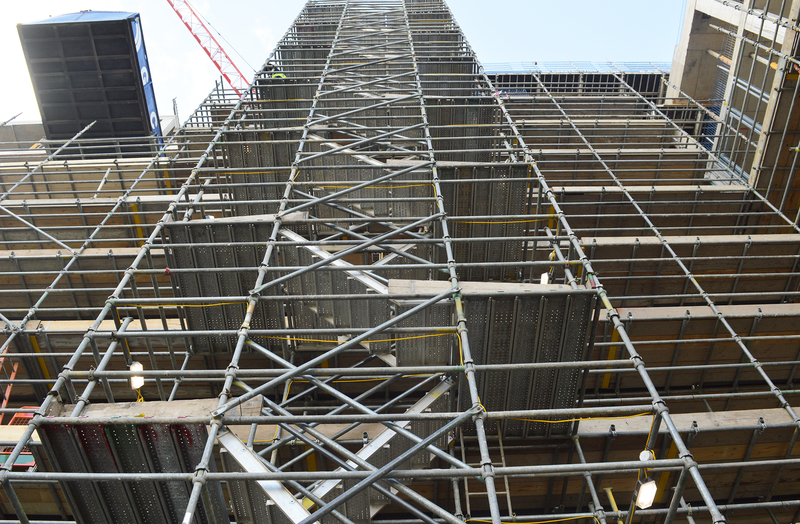 By using cup locks at every 500 mm to 1,000 mm, this type of scaffolding creates highly standardized systems that work well for scaffolding designs with repeated patterns. This is even costlier, but it is quite strong and safe. This scaffolding is known as patented due to its manufacturer company’s name. Patented scaffoldings are made from steel. They are fitted with special frames and couplings etc. They are ready made scaffoldings that are available in the market. Working platform is set on the brackets that are adjustable to the required level in this type of scaffolding. It is basically a brand which uses different type of scaffolding i.e. Kwikstage Scaffolding. In the countries like UK or Australia, this type of scaffolding is popular choice for scaffold designer. From residential to commercial applications, Kwikstage scaffolding is both easy to erect and relatively adaptable. This type of scaffolding is easy to assemble and disassemble. Non-slip platforms and double guard rails improve the safety and reliability of scaffolding. This type of scaffolding is used in shoring and also in suspended systems. Haki is one of the more contemporary systems. Unlike other scaffolding types, this one is both a name for the manufacturer and a non-generic scaffolding system. 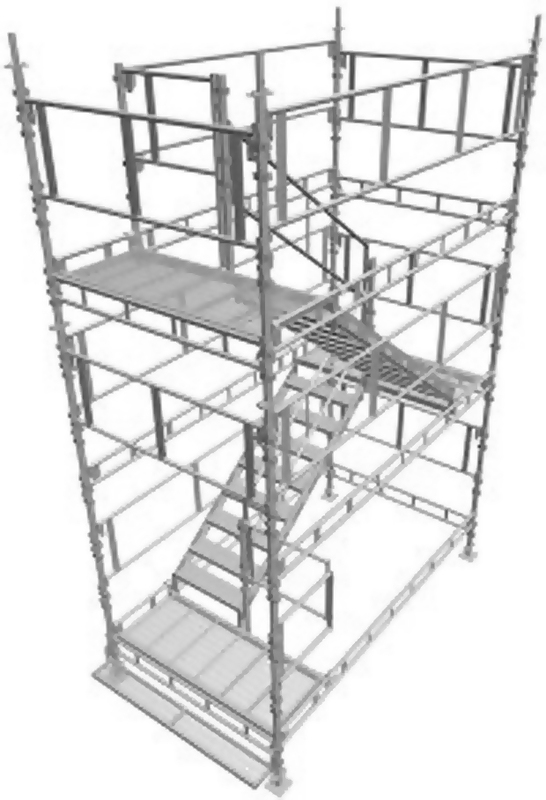 Based on safety, quality, and adaptability, this type of scaffolding is lighter and has fewer components than other systems. The system is recommended to carry more loads, making it into one of the more durable systems. Most of the scaffold manufacturers produce special components that are used to build a staircase scaffold tower as shown in figure. Oftentimes these staircases are a part of the scaffold structure that permit the workers to travel from level to level, but sometimes a stair tower is used on its own. As a scaffold designer, these particularly come in handy when workers need temporary, safe access to a section of the building. Also Read: Basic Guide for the Preparation of External Plaster! This type of scaffolding is very common for residential and commercial applications in North America and Europe. This type of modularized framework consists of frames, braces, planks, and bases. This scaffold is very light and can be erected very speedily. But, this type of scaffolding isn’t as strong as system scaffolding. You can see in image that, the frames stacked vertically on top of each other, and the cross bracing that connects them together. This type of scaffolding is commonly used in small-scale projects. Similar to suspended scaffolding, this type of scaffolding can extend to various heights. Instead of hanging from wires, this type of scaffold can go up and down on fixed mast structures that are placed on the ground. This type of scaffolding is used for heavy loads. Where there is a brick or block wall that needs to be built, you’ll see mast climbing scaffolding as it can be adjusted to get to various heights in small increments. 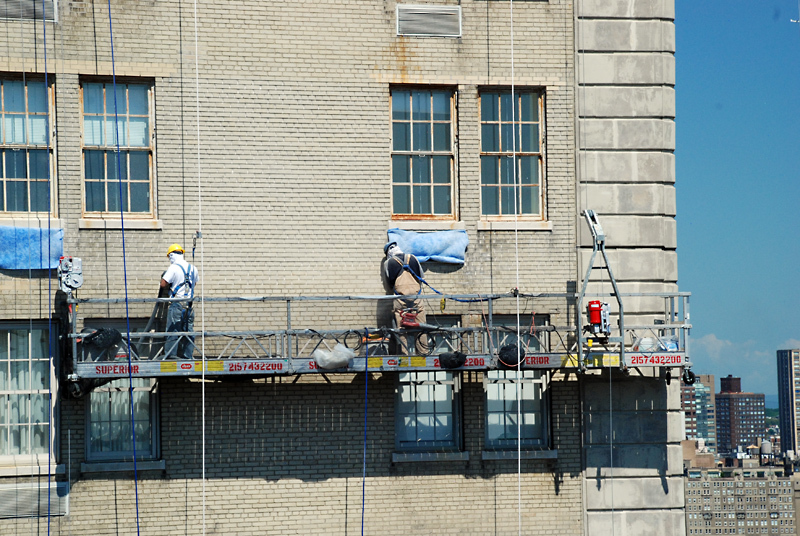 These scaffolds range in height, some only a couple floors tall while others climb up to several stories. Since mast climbers don’t require more space at the base of the structure, they’re ideal for projects with limited ground area. Whenever you see a concrete slab for a building floor, the concrete is almost poured on top of a form in order to hold the liquid concrete until it cures into a solid that can support itself. Most often the structure underneath consists of scaffolding. There are frame and brace systems that are manufactured to hold this weight, but it can be built out of any available materials. At construction site, safety becomes the top most priority. Thus, using scaffolding becomes compulsory for creating a protected and safe workplace for workers who work at heights throughout the building construction phase. Another advantage of using scaffolding is that it offers a level and balanced working platform, which facilitate multiple workers to work on a site concurrently. Next PostNext Various Exterior Cladding Materials to Modernize the Aesthetics of Your Home!